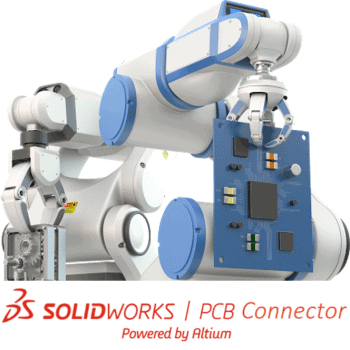 SOLIDWORKS PCB Connector takes the guesswork out of design collaboration, providing a managed environment for design revisions between Altium Designer and the SOLIDWORKS mechanical environment. SOLIDWORKS PCB Connector is engineered specifically to eliminate the barriers between the electrical and mechanical design teams. Closely integrate the design data between ECAD and MCAD environments making the linking of design data between Altium and your mechanical designer in SOLIDWORKS an easy and seamless process. Traditional use of STEP models and file translations for past collaboration is less than ideal. This tool takes the guesswork out of your design collaboration process and provides a managed environment for design revisions and keeps those design-critical components linked together as one. Keep your design process moving forward smoothly and facilitate collaboration between your electrical and mechanical design teams. Intelligently connected design data keeps everyone on the same page in the design process with unified data models. Stay at the peak of your productivity in a design environment that you know and trust, and let your mechanical designer do the same. When the electronic and mechanical design teams are working together, it’s easy to get products to market on-time and on-budget. Is SOLIDWORKS PCB Connector right for you? Let us help you decide.